The best way to get to know a community is by scheduling a tour. 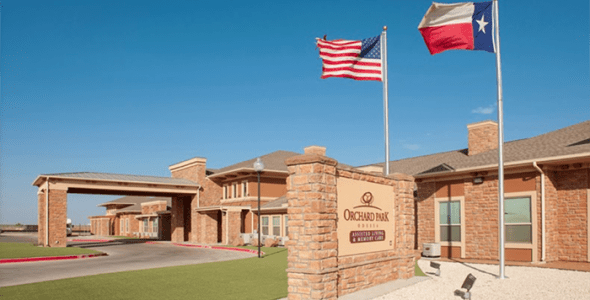 See the facilities, meet the staff and residents, and get a feel first hand what it's like to live at Orchard Park of Permian Basin Assisted Living. Spacious living rooms, private or companion apartments, formal and informal dining rooms, landscaped outdoor areas, and more combine to provide a safe, secure, and comfortable environment for each resident to ‘make their own’. A full range of activities are conducted on-site – with cookouts, outdoor leisure times, and trips for shopping, concerts, and tours. All provided with the care, concern, and the commitment of staff members whose only the goal is the comfort, well-being, and support of our residents. Making Life Better Every Day… For Every Resident. Our residents know — and we understand — this is their home. Our job is to make it the most comfortable, secure, and enjoyable home possible. We are privileged to serve, protect, and enrich the lives of some very special individuals. It is a privilege we take very seriously. Whether for you or a loved one, Orchard Park of Permian Basin offers a caring atmosphere, an active community, and a comfortable, secure lifestyle for our residents. Here at Orchard Park of Permian Basin, each member of our community enjoys the opportunity to 'live life their way'. Our valued residents enjoy assistance when required, and freedom when desired. Residency includes a complete array of services and accommodations.